Length 7.13", Width 3.03", Height 6.57" (Total Height 6.57"), F3 terminals (Terminal hardware included), Approx Weight 13 lbs. 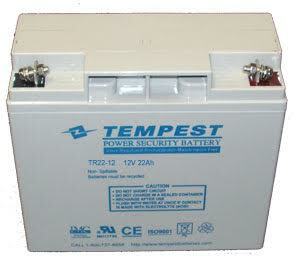 All Tempest TR22-12F3 Batteries are 90% charged when shipped. For most applications, we recommend you complete charging before use. Back Up Systems automatically bring the batteries to complete charge.